The Trans-Pacific Partnership, an agreement aimed at deepening economic ties between the United States, Canada, New Zealand, Japan and eight other countries in the region, has been largely shrouded in secrecy. Today, however, whistleblower outfit Wikileaks leaked a copy of the agreement's "most controversial chapter" which has prompted immediate criticism of its SOPA-like provisions that have Internet freedom-limiting potential. The Trans-Pacific Partnership (TPP) is currently working towards the creation of a regional free-trade agreement between several Asia-Pacific countries which together account for around 40% of the world’s GDP. The agreement aims to create deep economic ties between a dozen countries – Australia, Brunei, Chile, Japan, Malaysia, Peru, Singapore, United States, Vietnam, Mexico, Canada and New Zealand – by easing trade in goods and services, encouraging investment, and forging understandings across a wide range of policy issues. Negotiations between the nations have been running for around two and a half years and the TPP agreement itself is now reportedly more than 1,000 pages deep. 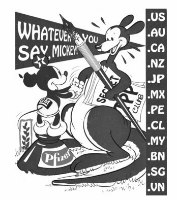 Overall the negotiations have drawn criticism for their secrecy but today Wikileaks announced that they had obtained a copy of the “most controversial chapter” from the TPP agreement which reveals the negotiation positions for all 12 countries on IP and copyright issues. Reception to the leaked agreement has so far been highly critical. Knowledge Ecology International notes that the TPP IPR chapter not only proposes the granting of more patents, expansion of rightsholder privileges and increased penalties for infringement, but also plans the creation of intellectual property rights on data. “The TPP text shrinks the space for exceptions in all types of intellectual property rights. Negotiated in secret, the proposed text is bad for access to knowledge, bad for access to medicine, and profoundly bad for innovation,” KEI concludes. “The WikiLeaks text also features Hollywood and recording industry inspired proposals – think about the SOPA debacle – to limit Internet freedom and access to educational materials, to force Internet providers to act as copyright enforcers and to cut off people’s Internet access,” Kilic says. Collectively the items in this version of the leaked draft reveal argument and opposition on dozens if not hundreds of points from one or several countries. In fact while there are many, many proposals, it is striking that there is a clear lack of final agreement across the board on almost all of the issues. Kilic describes the proposals as having reached a “negotiation stalemate.” His colleague, Peter Maybarduk, director of Public Citizen’s global access to medicines program, lays the blame for that at the feet of the United States. The full agreement can be downloaded here (PDF). c There are 159 comments. Add yours?